It could also be done with defining the open button as a toggle button Scenario 2). For both scenarios it is necessary to insert the video as a multi-slide synchronized video to be able to control the video with Captivate functionality. 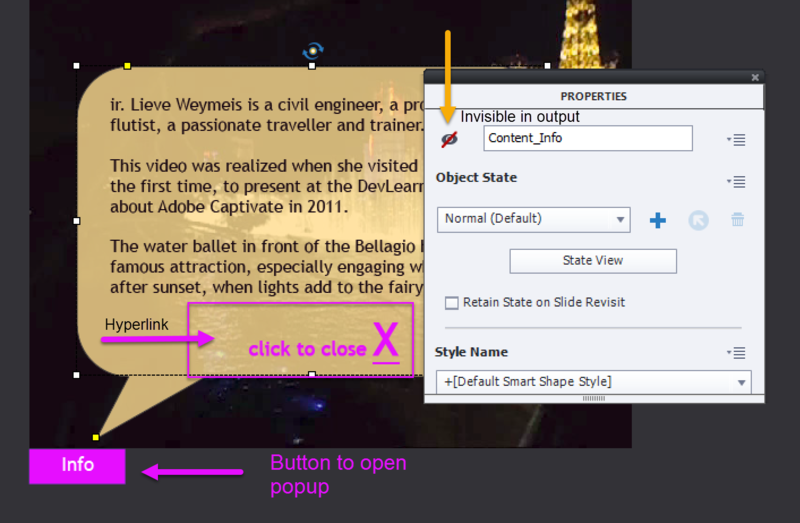 If you insert the video as event video it will play totally independent from Captivate. In this scenario the popup will appear with one button, and be hidden by another button or hyperlink. This makes it possible to have two actions, simplifies the setup: no need for a variable, no need for a conditional action. You can use two standard actions. If you want multiple buttons and popups, or expect to be using this work flow in other projects, I strongly recommend to create shared actions instead of advanced actions. This article will describe only the advanced standard actions. Have a look at the setup of the slide. Look at the Timeline panel. It has only 3 objects (from bottom to top: video, shape button, popup). 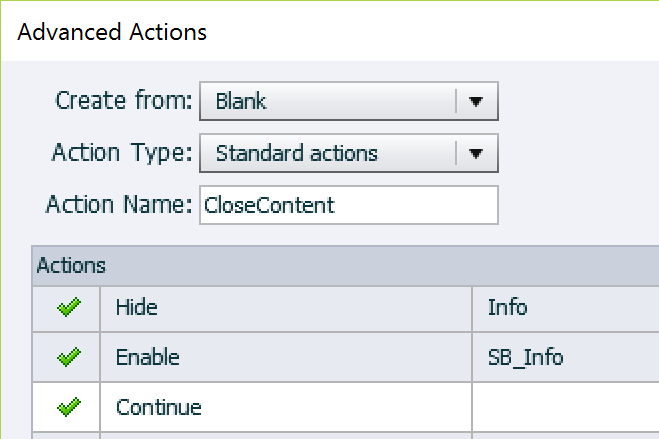 In the screenshot the shape button SB_Info is selected. It will open the popup 'Info'. Look at the Timing properties of the button. The option to pause is unchecked (which is not the default situation), the shape button is timed for the rest of the slide. The result is that the button will be active for the whole slide, there is no inactive part. The popup in this example is a shape used as text container, labeled 'Info'. That popup has to be invisible in output (eye icon in the Properties panel). If you expect that the slide can be revisited, a better approach is to use the On Enter event of the slide to hide this popup 'Info'. To close the popup I preferred using a hyperlink over a close button. The popup is ta single object. If you prefer to have a 'real' close button, you'll end up with two objects (text + button). In that case you can group them, to reduce the number of commands for showing and hiding. 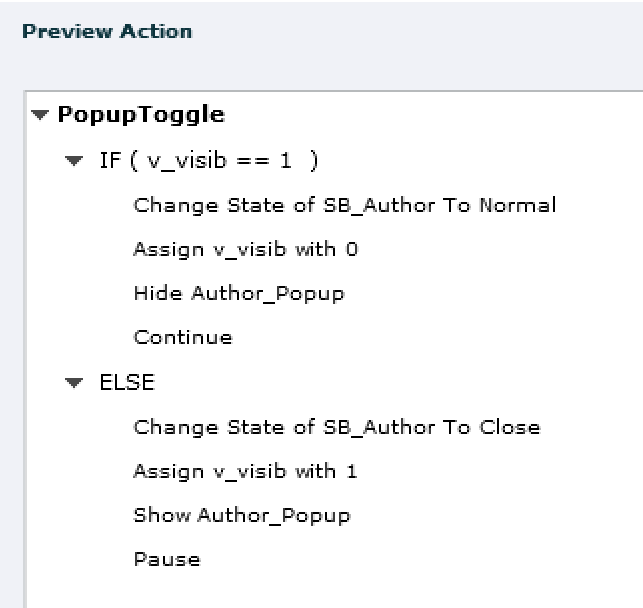 After showing the popup (only one text container, can also be a group), I choose to disable the button SB_Info. If you want it to more user friendly, you can add a custom state 'Inactive' to that button and change to that state. This will avoid confusion for the user, some may expect that button to be a toggle, which is not the case in this first scenario. 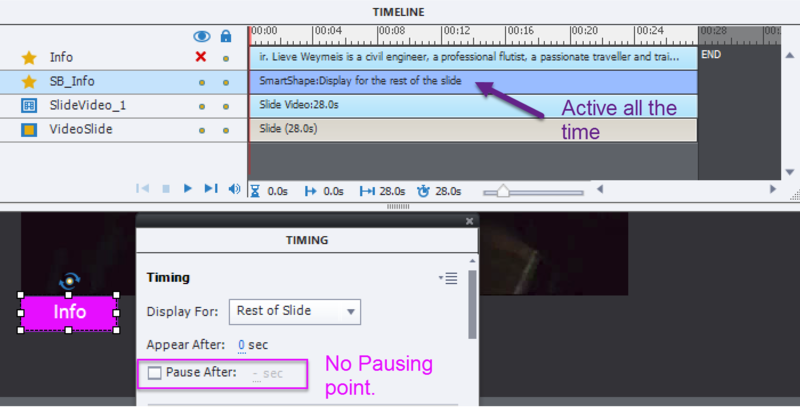 The last command will pause the timeline unconditionally, resulting in both video and audio to be paused. if you prefer a Close button, this same action will be triggered by the Success event of that button; you can use exactly the same action. If you are using a responsive project, or HTML5 output only, the work flow with a button is to be preferred because the hyperlink event is not to be trusted with HTML5 output. It is a similar advanced action (use the duplicate feature), with three commands which are the opposite of those in ShowContent: Hide (was Show), Enable (was Disable), and Continue which will release the Playhead, both video and audio will resume. In this scenario aToggle button is used both for opening and closing the popup. and value = 1 when the popup is visible; since I used a shared action from an external library, that variable is created automatically. An interactive video will often be spread over multiple slides, to offer navigation buttons to different parts of the video. It is not a problem to have the scenarios available on all slides: time both the button and the popup groups for the rest of the project, always on top. I mentioned the possibility to group a close button with text, but groups with more objects are possible as well: image, shape, animations. Group all together, hide the group On Enter for the slide, and you only have to replace the single object in the scenarios above by the group. Turn the actions into shared actions, and keep them in a separate project. You can open the Library of that project as an external Library in future projects. 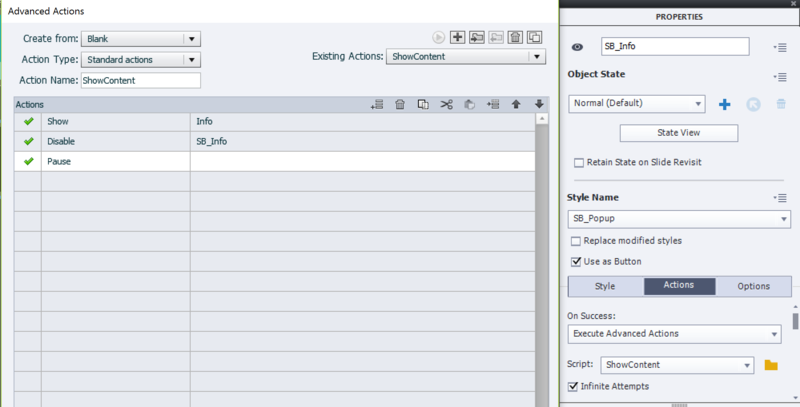 Especially the toggle action, it will save time because you don't have to create the user variable. Future use case, example of Pausing the timeline, will be about audio. It is more complicated because there are several ways to use audio in Captivate, perhaps I will need more than one post.